The commemorative Bulgarian stamps of 1920 to 1928 continue the celebration of the liberation of Macedonia, tributes to famous personalities, and celebrate the anniversary of their tsar. The six portrait commemorative stamps shown above (Sc. 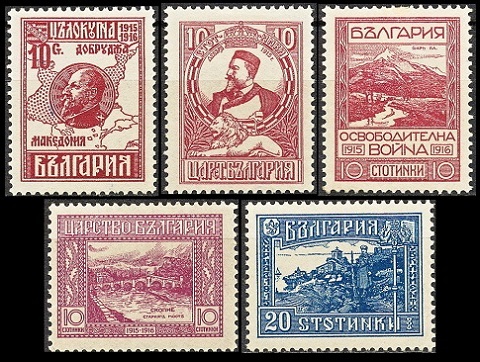 #147-152) were issued on October 20, 1920 to celebrate the 70th Birthday of Ivan Vazov. 30 S. - Birthplace of Vazov at Sopot. 50 S. - "The Bear Fighter" from "Under the Yoke". 01 L. - Ivan Vazov in 1870 and 1920. 02 L. - Ivan Vazov. 03 L. - Homes of Vazov at Plodiv and Sofia. 05 L. - The Monk Paisiy Hilendarski. Paisiy Hilendarski (1722-1773), also known as Paisius of Hilendar, was an 18th Century Bulgarian clergyman and historian. He is considered a forefather of the 18th Century Bulgarian National Revival. Ivan Vazov (1850-1921) was a Bulgarian novelist, playwright, and poet. He is best remembered for his classic 1888 novel, "Under the Yoke", the story of Ottoman rule in Bulgaria. Being from Sopot, the author did take an active part in the April Uprising of 1876 and in the Russo-Turkish War, which led to Bulgaria's independence from the Ottoman Empire. 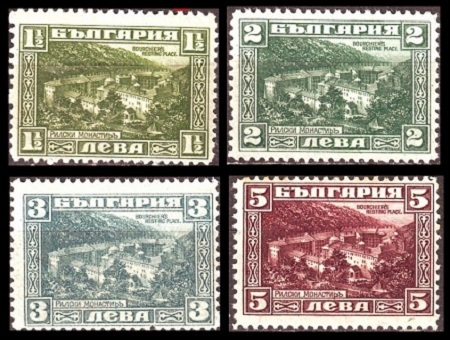 The five pictorial Bulgarian stamps shown above (Sc. #153-157) were originally intended to be part of the Liberation of Macedonia set of 1915, however they were not issued until June 11, 1921. The designs, in the order that they appear above, are as follows. 10 S. - Tsar Ferdinand. 10 S. - Mt. Shar. The Šar Mountains extend from Kosovo and Northern Macedonia to Northeastern Albania. 10 S. - Bridge over the Vardar River. 20 S. - View of Ohrid. 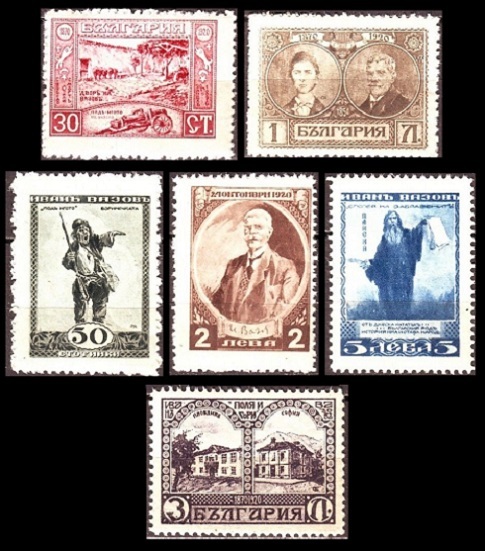 The nine commemorative Bulgarian stamps shown above (Sc. #171-179) were issued on December 31, 1921 as a Memorial to James D. Bourchier. The three common designs, in the order that they appear above, are as follows. Bourchier in a Bulgarian costume. View of the Rila Monastery. James David Bourchier (1850-1920) was an Irish-born journalist and political activist. He worked as the Balkan Correspondent for the London Times and lived in Bulgaria from 1892 to 1915. He became an advisor to Tsar Ferdinand of Bulgaria and acted as an arbitrator at the conclusion of the Balkan Wars of 1912-1913. He died in December 1920, and he is buried near the Rila Monastery in Southwestern Bulgaria. 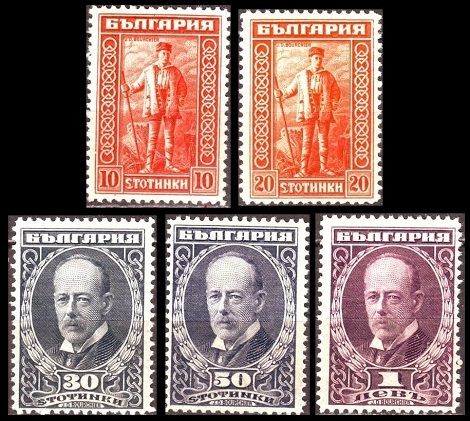 The three pictorial Bulgarian stamps shown above (Sc. #204-206) were issued on June 2, 1926 to commemorate the 50th Anniversary of the Death of Hristo Botev. The common design features a portrait of Hristo Botev. Hristo Botev (1848-1876) was a Bulgarian poet and revolutionary. He was a leader in the Bulgarian struggle for independence from the Ottoman Empire during the April Uprising of 1876. Botev was killed by an Ottoman sharpshooter on May 20, 1876. 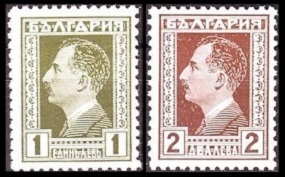 The two pictorial stamps shown above (Sc. #211-212) were issued on October 3, 1928 to celebrate the 10th Anniversary of the Reign of Tsar Boris III. The common design features a portrait of Tsar Boris III.